It’s actually feeling like fall here this week. Cooler weather, drizzly rain, and earlier sunsets are making it clear that summer is gone. Just in time to help warm up the house with the oven, Ruhlman's How to Roast has appeared, and I received a review copy. This new book covers the basics of oven roasting everything from the Thanksgiving turkey to roasted fruit for dessert. He starts by explaining what roasting has come to mean. Originally, roasting involved a spit and fire, but these days, the process of roasting is really the same as that of baking. The different names are used depending on what is being cooked. With either name, it’s a “dry-heat cooking method.” And, it’s a pretty easy way to make things delicious when they take on a golden crispness in the oven. Starting with a classic roasted chicken, Ruhlman walks you through the simple steps of seasoning, bringing up to temperature, prepping, roasting, and carving. Beef, pork, lamb, fish, and shellfish are all covered including an actual spit-roasted leg of lamb, and then there are lovely, golden, roasted vegetables. I’ve roasted all sorts of vegetables over the years. Usually, I just toss the vegetables with some olive oil, maybe add some sliced garlic or smashed whole cloves of garlic, and pop them in the hot oven on a sheet pan. But, now that I’ve tasted the wonder of roasting cauliflower in a cast iron skillet with butter, I may never go back. The Roasted Cauliflower Polonaise recipe caught my eye because it was completely unfamiliar to me. I learned that Polonaise refers to any dish topped with buttered breadcrumbs and hard cooked eggs. Here, there’s also a splash of lemon and chopped fresh parsley. It’s one of two recipes that uses Basic Roasted Cauliflower in the book, and I highly recommend it. Now, I have to explain that I took option B in making this dish. Option A would have been to roast the whole head of cauliflower intact. Then, it would have been served in the cast iron skillet and portions would have been cut as wedges. It’s a lovely, old-school kind of preparation and presentation, but since I was just cooking for two, I went the simpler route. I cut the head of cauliflower into florets, and roasted them in the skillet with butter. Every ten minutes or so, I turned the cauliflower pieces and spooned melted, browned butter over the tops. The cauliflower pieces roasted for about 40 minutes total, and came out of the oven nicely golden. Meanwhile, I hard-cooked two eggs, chopped parsley, and toasted breadcrumbs in melted butter on top of the stove. To serve, I transferred cauliflower pieces to a platter, squeezed lemon juice over the top, added the toasted buttery breadcrumbs and chopped eggs, and garnished with parsley. For me, this was a vegetarian main course. The buttery goodness was undeniable, but the crispy breadcrumbs, bright lemon, and rich chopped egg combined delightfully. My next stop in the book will either be the Duck Fat-Roasted Potatoes or the Roasted Pineapple with Vanilla Ice Cream and Caramel Sauce. The oven is going to get plenty of use this fall. Recipes reprinted with publisher’s permission from Ruhlman's How to Roast. Copyright ©2014 by Ruhlman Enterprises, Inc. Courtesy Little, Brown and Company. The book is available at Barnes and Noble and IndieBound. Boiled cauliflower with hard-cooked eggs, bread crumbs, and parsley? When I first learned this old preparation, in a culinary basics class at the CIA, I thought it was too goofy for words. But when I asked my cooking partner, Adam Shepard, what he thought of it, he said, “I’d serve it at my restaurant. Though I’d figure out a way to make the egg and bread crumbs stick to the cauliflower.” That he took it seriously made me take it seriously. As my appreciation of classic dishes grew, so too did my affection for this dish. Prepare it with roasted cauliflower rather than boiled, and it becomes a great dish for any occasion. • PLACE the hot roasted cauliflower on a serving platter. If there is no remaining butter in the skillet, add another tablespoon. Add the bread crumbs to the skillet and cook over medium-high heat till they’re toasted. 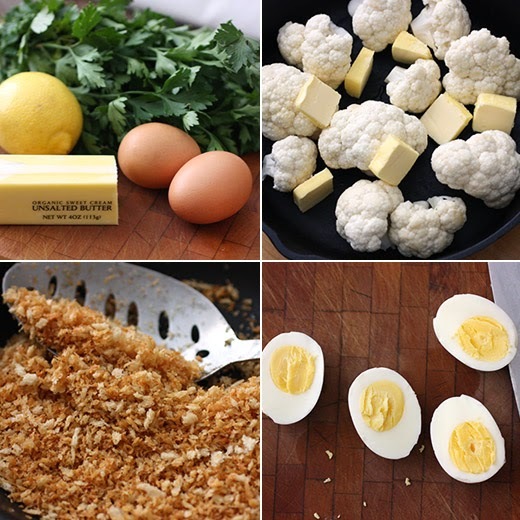 • SQUEEZE the lemon over the cauliflower and then spoon the toasted bread crumbs over the cauliflower. Spoon the chopped egg over the cauliflower (don’t worry if it doesn’t stick). Sprinkle it with parsley and serve in wedges or slices, scooping up extra garnish as you do so. • If you’re using roasted florets, melt 1 tablespoon butter in a separate small skillet over medium-high heat and toast the bread crumbs. To serve, simply sprinkle the lemon juice, toasted bread crumbs, chopped egg, and parsley uniformly over the top of the florets and serve right from the skillet. • PREHEAT the oven to 425˚F/220˚C (use convection if you have it). • Cut the stem and leaves off the cauliflower so that it will sit flat in a skillet; the more of the cauliflower that’s in contact with the skillet the better, as it gets very brown and tasty. • Set the cauliflower in an ovenproof skillet and smear the butter all over the surface. Give it a liberal sprinkling of salt. • Serve immediately, in wedges or slices, or keep warm and reheat for a few minutes in a hot oven before serving. Love Polonaise cauliflowers! The crunchy toasted bread crumbs make it particularly delicious. Mmmhhh, this dish is wonderful! A mouthwatering combination. I'd love this recipe, and I'd really love that cookbook. Roasting vegetables is the best way to serve them, any day of the year! 2 of my favorite things....cauliflower and eggs! Love the combination, will try it! Happy weekend Lisa! Would you believe I've actually prepared this dish before a very long time ago. Polonaise dishes were once quite the fad for those of us trying to impress the husband's co-workers. Although I haven't made it in years, I do remember how delicious it tastes and the presentation is very cool. I always did mine as a whole cauliflower first boiled. I'd love to try roasting it though. The depth of flavor must be amazing! Wow Lisa this sounds so good. I know boring comment, but I just love this. I would love to dip this in some fresh bearnaise sauce. Doesn't that sound good? This is one dish I haven't heard of before, but I know I would love the boiled egg and cauliflower combo. It sounds so good! 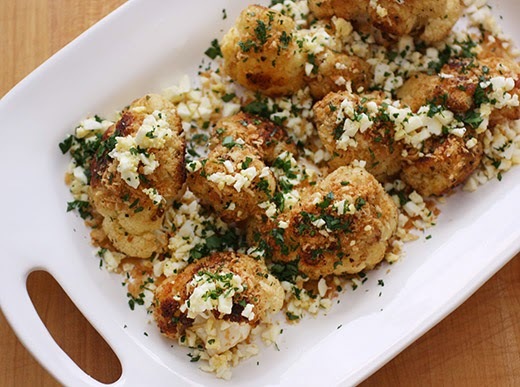 Roasted cauliflower is so my favourite, this dish looks delicious! I really like the colour and I bet it would be very filling no? 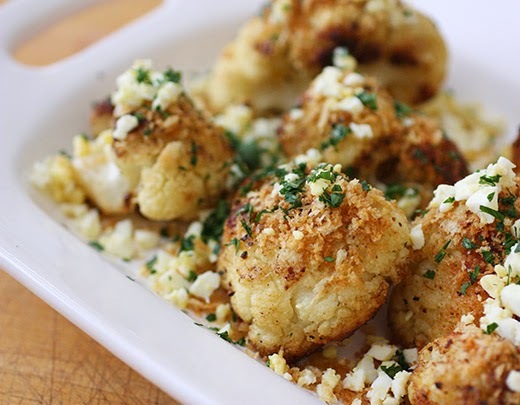 What a great way to serve cauliflower! Definitely a dish I need to try.. looks delicious! Love roasted cauliflower, what a lovely way to prepare it. This is a real keeper! we just had roasted cauliflower last night and i wish i had seen this before! sounds like a magnificent blend of flavors and textures. To me, this is a very new kind of way of cooking cauliflower but one that sounds really good. Oh, yeah, I'd be delighted with this for my entree! I adore roasted cauliflower! One of my favorite dishes when I was a kid was roasted cauliflower.. i could eat it alone..yummy! I actually much prefer the cauliflower roasted in smaller pieces. For some reason, the look of the huge cauliflower roasted doesn't appeal to me, although most people find it beautiful. Oh cauliflower is one of my favorite fall vegetables and roasted is the best. I like the recipe and the addition of hard cooked eggs. Wow this looks delicious! I have never had a dish like this before, but a neat way to jazz up cauliflower! I'm such a cauliflower fan, I must try this recipe. Like you, I'll divide the cauliflower into chunks. Pinning this one.